Short-break trips to the Alps can give you three refreshing days on the snow and leave you with the feeling of having been away for ages. We love them and frequently take them. Whether you travel independently or as part of a package, short-stay trips are easier to arrange now; the choice of airlines, destination airports and onward transfers is wider than ever. Midweek trips can be even better than weekends: cheaper deals and, depending on the resort, perhaps quieter slopes. With just a few days to enjoy, you’ll need to plan your short break carefully; but that’s all part of the fun. We sum up the options here, with a few handy tips to help you to maximize your slope time. Also see our Corporate ski trips feature, which gives ideas for fun activities on a short break away. Resorts closest to your arrival airport may seem the obvious choice, but travelling a bit further can avoid weekend crowds. You could also try smaller resorts that you would not go to for a week’s stay. Geneva is the classic gateway to the western Alps, with Chamonix just over an hour away, and other major French resorts such as Megève, Flaine and Morzine close by. Allow extra time for the Trois Vallées and Tarentaise resorts. You could also head into Switzerland and visit Villars or Verbier. In Italy, Turin is a handy airport for the Aosta valley, with Courmayeur, Champoluc and La Thuile easily reached; Sauze d’Oulx and Montgenèvre in the Milky Way are even nearer. Further east, in Switzerland, Engelberg and Andermatt are popular options easily accessible from Zürich. So is St Anton. Also in Austria, Innsbruck allows you to combine a city break with doorstep skiing. There are lots of resorts surrounding the city, and the Stubai valley with its reliable glacier is nearby. Similarly Salzburg has lots of resorts within an hour or two. The Pyrenees offer short-break opportunities too: flights into Pau and Lourdes put you close to Cauterets, Barèges-La Mongie, Peyragudes and St-Lary-Soulan. And for a budget break, you could explore Slovenia very cheaply, with flights to Ljubljana – the nearest ski area is just 8km from the airport. The range of short-stay accommodation is improving, but can still be limited in some major resorts – places such as Chamonix, Crans-Montana and Morzine, with big summer or conference business, are easier. From Salzburg or Innsbruck you could take the daily shuttles to different resorts. If you have a rental car, valley towns such as Chur, Sion and Interlaken in Switzerland, Aosta in Italy and Moûtiers and Bourg-St-Maurice in France are cheaper bases from which you can visit different resorts nearby. Going through a tour operator can save hassle, time and money. They can organize transfers or car hire, equipment rental, ski passes and so on and have special deals with hotels. As well as tailor-made weekend or short break trips for couples or groups, Momen tries to think of different ideas. This season he is running the fourth Mountain Gourmet Ski Experience featuring top UK-based Michelin-starred chefs recruited by Heston Blumenthal. This season’s event takes place in Courmayeur from 17 to 20 March 2017 and includes three days of skiing, mountain lunches in Heston’s favourite spots with specially selected menus and the opportunity to meet and chat with the chefs. The highlight will be two very special dinners created exclusively for the event by the guest chefs – Sat Bains, Claude Bosi and Jason Atherton. And in December 2016 Momentum is running The Skeleton Experience for the third year. This is a trip to Innsbruck with Amy Williams, who won the gold medal in the skeleton event at the 2010 Winter Olympics in Vancouver. Guests will get the chance to go down the modernized 1975 Olympic track at Igls as a passenger in a race bobsled and then on their own on a skeleton (after technique training from Amy). Ski Weekend are the original short break specialists who pioneered this niche market back in 1987. About two-thirds of their business is to the Chamonix valley and they know it like the back of their hand, with access to a huge range of accommodation (including their own catered chalet), guides and instructors. Doug Newman, Ski Weekend’s Sales and Marketing manager said ‘We offer a very personal service, with staff in our office who you can chat to and who have a thorough knowledge of all the resorts we offer and the accommodation from first-hand experience. We really are different to the others who have joined the market since our inception, and our philosophy remains that anything is possible’. Ski Weekend offer flexibility for you to arrange whichever parts of the holiday you want to and they do whatever you don’t want to do. For Chamonix specifically, they also have premium levels of service that include lifts to and from the slopes each day. They also have pre-arranged courses using local guides and instructors which you can book in advance – with both on-piste and off-piste options. And Doug Newman says ‘We also excel in unique experiences such as heli-skiing, Vallee Blanche and glacier itineraries as well as our unique Top Secret weekends, where we search out the deepest powder around’. Ski Weekend’s 2016/17 season kicks off with a popular Warm Up Weekend from 25-29 November. Stanford Skiing is a family-run company which specializes in Megève in France. Owners John and Kathryn Kinnear have been skiing in Megève for 25 years and spend virtually the whole winter in the resort while daughters Elizabeth runs the office in Norwich and Caroline looks after the accounts. 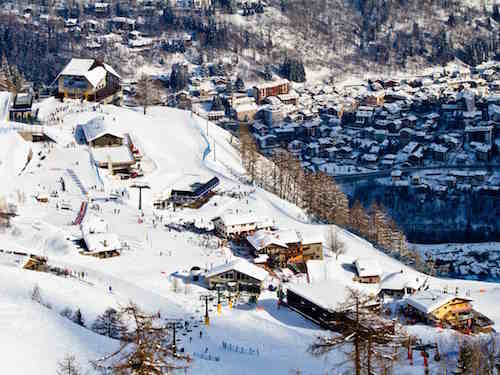 Megève is only 75 minutes from Geneva airport and so very convenient for a short break. And Stanford has its own fleet of mini-buses and drivers to provide airport transfers. Stanford run their own catered chalets and chalet-hotels and offer 3- and 4-star hotels and self-catered apartments – all available for 3- or 4-night stays. We have stayed happily in their cheap and cheerful chalet-hotels (converted from former 2- or 3-star hotels) several times and met many happy regular guests whenever we’ve stayed. The bar prices must be about the cheapest in the Alps – beers at 2 euros and a good bottle of wine 8 euros our most recent visit. Around 50% of business for Ski 2 is short breaks to Champoluc in Italy’s Monterosa ski area. They specialize in Champoluc and know the village and hotels as well as any locals. They also have their own equipment rental shop, ski school and mini-bus which they use to ferry you around the village and to the lifts if you need it. Their prices include private transfers – picking you up and dropping you off for any flights from six airports within striking distance – ski pass and vouchers for a lunchtime snack up the mountain. Inghams has expanded its short breaks programme for this season and now offers them to over 20 resorts in all the main Alpine countries plus Norway. Unless booking at short notice, avoid low resorts (where snow may be unreliable) and high, treeless resorts (where slopes may close in bad weather). Go for early or late flights to get the most slope time, but note that Sunday evening traffic can be horrendous with locals going home. Book a transfer or rental car in advance and choose a different car hire company from the one your airline promotes to avoid queuing with others from your flight. Taxis are generally very expensive, and public transport is rarely convenient (though Switzerland has good rail links). Rather than take your skis/board, consider renting: most airlines charge hefty carriage fees.